Eco-friendly concessions! 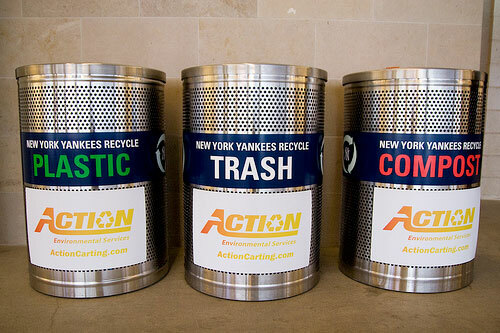 The Yankees Sustainability Program is working to insure eco-friendly options at all concessions including beverage cups made of biodegradable material and paper products that are 100 percent recyclable. Other "green" things going on at the new Yankee Stadium include a state-of-the-art lighting system and light banks that use energy efficient bulbs and water-saving toilets and waterless soap to the restrooms. And, from what I've also read the new stadium traded air conditioning for "natural cooling" in areas like The Great Hall and the new retail center. Throughout the stadium there were trash bins, compost bins and plastic recycle bins. At the start of the game, there was a player message about the importance of recycling and making sure to use the appropriate bins at the stadium. There's also a "farmer's market" with fresh fruits and vegetables. The farm market may not really be much of a market - more of a small cart and some baskets with produce by Melissa's - but it's something. Whether or not fans will choose fresh fruit over a hot dog and fries remains to be seen. With these small initiatives at the stadium, I felt a little less guilty about going to the game on Earth Day. It was nice to see a touch of "green" beyond the field. Go Yanks!